The Celina Bulldogs volleyball team has strived to go far this 2010 year. With a record of 21-5, the Bulldogs are looking towards regional semifinals on Wednesday, Nov 3, where they face Padua Franciscan (17-7) at 6 o’clock. A spirit bus may be taken to Ontario, OH for Wednesday. On Saturday, the Dogs faced Pemberville Eastwood. The match was very intense. Celina started off weak in the first game, losing a close game with a score of 24-26. The second time around Celina came fired up and ready to bounce back as they took the game, 28-26. Their intensity kept them in the third game, winning 25-19. The fourth game though, Eastwood shot back winning 22-25. The Bulldogs and the Eagles were fighting for the district final champs as it came down to a fifth game. The Dogs started off strong, taking a huge lead at the beginning which fired the Bulldogs up. Ending the game, 15-10, the Celina Bulldogs came home with being district final champs for the 5th time in a row. 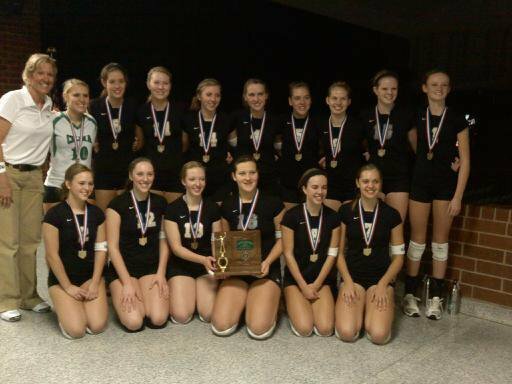 The Celina Bulldogs volleyball team has done a great job this year. Keep cheering them on and good luck! It's Time to "Fall Back!" Spirit Bus - STILL ON!